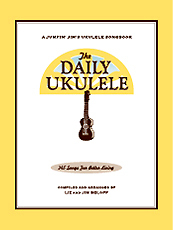 Compiled and Arranged by Liz and Jim Beloff, The Daily Ukulele features 365 well-known songs with easy ukulele arrangements in a easy to read 9X12 format. All arrangements feature melody, lyrics and uke chord grids and are in ukulele-friendly keys that are particularly suited for groups of one to one hundred to play and sing. Includes favorites by The Beatles, Beach Boys and Bob Dylan, folk songs, pop songs, kids songs, Christmas carols and Broadway and Hollywood tunes, all with a spiral binding for easy usage. Also features a tips and techniques section, chord chart and vintage ukulele-themed photos and art throughout. The Daily Ukulele offers ukulele fun all year long! 336 pages. LOWER SHIPPING CHARGES! : Due to the size and weight of the Daily Ukulele songbooks, we have found Media Mail to be the most economical shipping choice throughout the continental USA. Therefore your shipping charge of $8 reflects Media Mail, approximately a 6 day ship time. If you prefer a faster method, please email or call for a quote. Typical Priority Mail from the east coast is more than double.